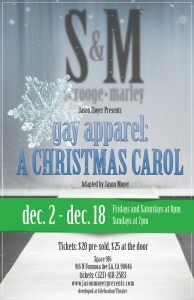 Now in its fourth year, producer Jason Moyer has announced a limited engagement of gay apparel: A Christmas Carol, at Space 916 in Hollywood, opening on Friday, December 2 and running through December 18 only. gay apparel: A Christmas Carol follows Scrooge, the world famous fashion designer who created the line S & M with his partner Jacob Marley. Following Marley’s death, Scrooge’s life has spiraled into a dark and dreary abyss. Then, one Christmas eve, Scrooge learns that life is about more than what you have; it is about the people with whom you share it. gay apparel is the story of Scrooge’s coldness and anger, and ultimately, a tale about the healing power of love and redemption. And … it has ghosts … and they’re gay. Adapted and directed by Moyer, the cast of will feature (in alphabetical order) Leon Acord, Samara Bay, Nicholas Harsin, Rachael Meyers, Justin Ross, Kenneth Sears, and Rick Simone. Costume design is by Miguel Montalvo. gay apparel: A Christmas Carol is set to open on Friday, December 2 at 8pm, and performances will continue on Friday and Saturday at 8pm, and Sunday at 7pm, through December 18 only. Admission is $20 in advance and $25 at the door, and tickets may be purchased online by visiting www.jasonmoyerpresents.com or by calling (323) 418-2583. Space 916 is located at 916 Formosa Avenue in Hollywood, 90046. Erich Bergen, best known from the cast of Jersey Boys and television’s Gossip Girl, rings in the season with A Holiday Party, a swinging, upbeat kick-off to the end of the year festivities, at The Coterie at the Hollywood Renaissance Hotel, on Monday, December 5 at 8pm. Featuring music direction by American Idol’s Michael Orland, A Holiday Party will include many holiday favorites, new tunes, and plenty of joy and laughter. This one night only event will also include a special guest appearance by Lindsay Pearce, from the cast of Glee. 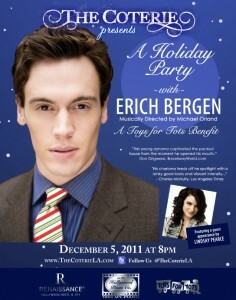 Erich Bergen’s Holiday Party is a benefit for Toys for Tots. Patrons who bring a new, unwrapped toy to The Coterie on December 5 will gain admission to the showroom with no cover charge. From November 27 through December 18, Bergen will be appearing as The Prince in A Snow White Christmas opposite Lindsay Pearce, at the El Portal Theatre in North Hollywood. This production will be an updated version of the classic tale, presented in the style of the traditional British family Panto, a modern musical play based on fairytale stories. A panto is known for bringing together families with its interactive style and humor that appeals to fairytale fans of all ages. Bergen’s debut CD, titled The Vegas Sessions, released in the fall of 2010, features new studio recordings of original compositions in the pop genre, along with live tracks recorded during three sold out concerts in Las Vegas in April, 2009. 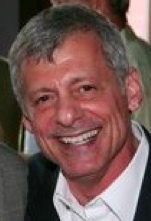 The disc is available at iTunes, Amazon.com, CD Baby, and other digital music outlets. Doors open for A Holiday Party With Erich Bergen at 7:00pm for dinner and cocktails, and the show begins at 8pm. Tickets are $10 in advance, $15 at the door one hour prior to showtime, and admittance is free with a new, unwrapped toy for Toys For Tots. To make reservations for complimentary admission, patrons must send an email to erichselves@gmail.com with their name and how many people in their party. Toy donations will be collected at the door. A VIP ticket package is available ($40), which includes reserved prime seating, a post-show meet and greet with the performers, and an autographed copy of Erich’s CD. Standing Room Only (SRO) at the Bar tickets are $5 in advance (must be over 21 years of age), and $10 at the door, one hour prior to showtime. Dinner and drink minimums apply. To purchase tickets, go to www.brownpapertickets.com/event/211140 or call (530) 426-8374. For more information, visit www.thecoteriela.com. The Hollywood Renaissance Hotel is located at 1755 N. Highland Avenue in Hollywood.